Wondering how to optimize a blog article to improve SEO? Search Engine Optimization (SEO) has become an important topic for B2B business ever since the power for product research shifted from the seller to the buyer. The importance of ranking onto the first page of search engine results for your website content has never been higher. As your ideal prospect searches for the cause of problems or for solutions, whichever answers appear on the first page of search get the attention. What's more, the people, who are searching for answers, are ready buyers of your products or services. They have the potential of being your best prospects. delivering content based on the searcher's intent. 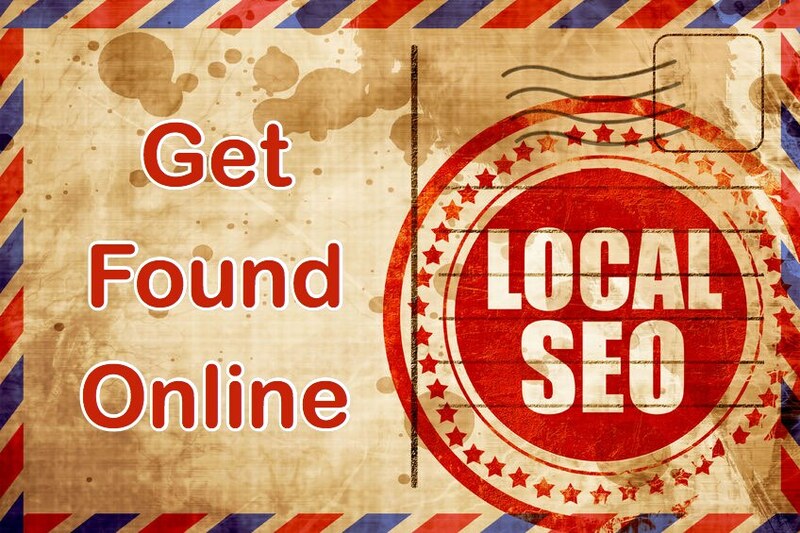 Additionally, search engines have become much more sophisticated with their ranking algorithms as well. Among the techniques used by search engines are visitor time on page and pogo-sticking behavior. Pogo sticking is where a visitor comes to a page from a search and immediately hits the back button. When your page experiences pogo sticking by visitors, it has a negative impact on the page search rank because search engines identify time on page as a signal of quality. Above all, the content has to be remarkable to satisfy the reader and rank well with search engines. Without high-quality content, the visitor time on page is reduced. Google Analytics defines the bounce rate as the percentage of visitors who visit a website who only visit one page. If you have high-quality content on your website, your bounce rate will be low. 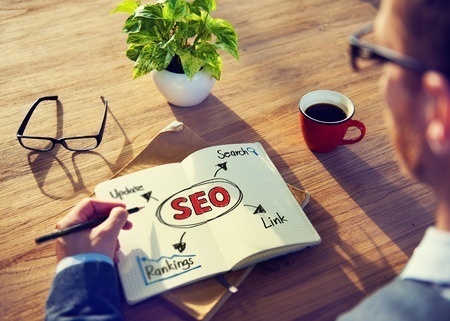 Wondering how to optimize a blog article for SEO? This article includes an Infographic to help you. SEO is a very technical field. Consider hiring a professional to help you in addition to learning these tips. In addition to the website content quality requirement, bloggers should establish a long tail keyword for each blog article and take steps to optimize the post for it. We like to call it a keyphrase versus a keyword because it includes multiple words. The benefit of optimizing on more than one word is it is easier to rank for a phrase than it is for a word, mostly due to lower competition for the keyphrase. Keep your keyphrase aligned with the search your prospects would conduct when looking for your products. 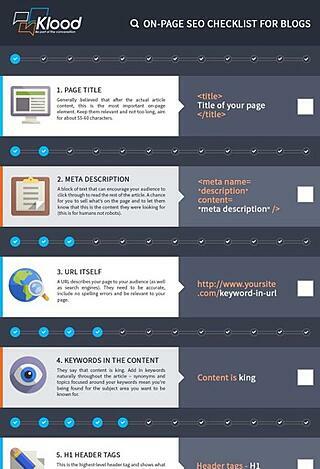 The infographic to the right provides a checklist of page elements to improve SEO. Click on the graphic or this link to view the infographic. 1) Include the key phrase in the page title. 2) Write the meta description for humans and include the key phrase. 3) Add the key phrase in the page URL and use hyphens to separate each word. Search engines see hyphens as spaces. 4) Your content should include multiple occurrences of the key phrase, however, do not artificially "stuff" the keyphrase in an unnatural way. The content must be written well for humans, not contorted for a search engine. 5) Use the keyphrase in an H1 header tag in one of your content titles in the article. 6) Use the key phrase in one or more H2-H6 header tags as well if it naturally fits. 7) It is important to use images in your blog article. When naming the image file include the keyphrase with hyphens between words. 8) Add detailed alt tags for your images and include the target keyphrase. 9) When posting the article on your blog, assign a few categories for it. Categories help with search rank because they are indexed for the search as well as an individual post. Category specific articles can become a great attraction for visitors. 10) External linking to high-quality articles also improve search rank for your article because it shows the search engines that the article educates the reader. Use at least three outbound links per blog article. Be sure to set the link to open up in a new window so the user does not leave your blog. 11) Be sure to include several internal links to other content on your website because it contributes to building authority for your other website pages. 12) Google authorship helps to build the authenticity with the Google search engine. Even though Google stopped displaying the author's picture in the search pane, authorship still provides authority for the content because Google understands that it is shared by a real person. 13) Be sure to share your blog articles on each social media channel that your readers use to find content. It is very clear that social sharing by your readers is used by search engines as an indicator of good content. Share on social networks like LinkedIn, Twitter, Facebook and Google+ have an impact on the visibility and rank of your content. 14) Actively requesting inbound links from authoritative websites. This includes the process of performing competitive SEO analysis and seeking inbound referrals from the sites that rank higher than yours. Website owners are always looking for high quality content to share with their audience. They may not be aware of your site - feel free to ask, the worst case scenario is they can ignore you or say no! If you need guidance while writing your blog article and are looking for tools to help you do it. 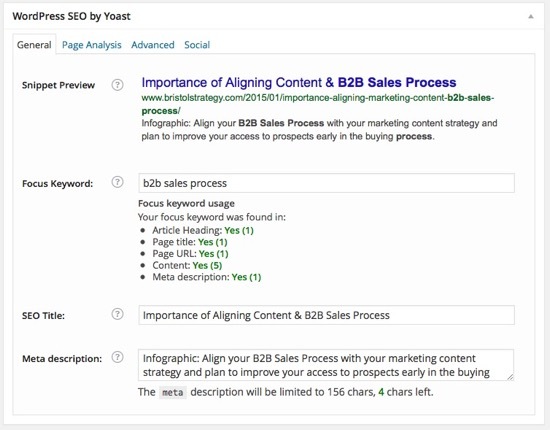 Marketing automation tools like Hubspot guide the author through the SEO process while they write their blog in the Hubspot tool. If you choose to author the blog article outside of the tool and then import the text, Hubspot analyzes the article based on the key phrase you set and provides advice on how to improve the article's SEO. The thing I like the most about Hubspot is that their SEO capability does not end with authorship. It goes well beyond by recommending additional search terms to target for your visitors and much more. Click on the image for the complete list. The most popular blog SEO tool for Wordpress is the Wordpress SEO by Yoast. Yoast has a wide variety of SEO tools for blog articles and website pages. The image shows one of the Yoast tabs for a recent blog article. The plugin analyzes the blog article for 18 different SEO factors and rates it while providing a "street light" style ranking of Red - Yellow - Green based on the articles ranking on each SEO factor. Click on the image for more details. If you find Search Engine Optimization confusing, you always can reach out to a company that offers services to help you improve the overall performance of your website. 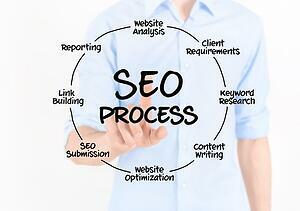 Of course, Bristol Strategy offers SEO as part if our Inbound Marketing and Website services. Click on the image below for a white paper that describes the 17 SEO myths to leave behind when working on your next blog or website page development.